Ferran Adrià's El Bulli changed the food world. Then it closed. But Adrià has found a way to bring back epic dishes like this one. In his new seven-part book, elBulli 2005-2011, Ferran Adrià chronicles the culinary highlights of his seminal, now-shuttered restaurant on Spain's Costa Brava. Each volume captures a year at El Bulli, including the key moments and techniques. 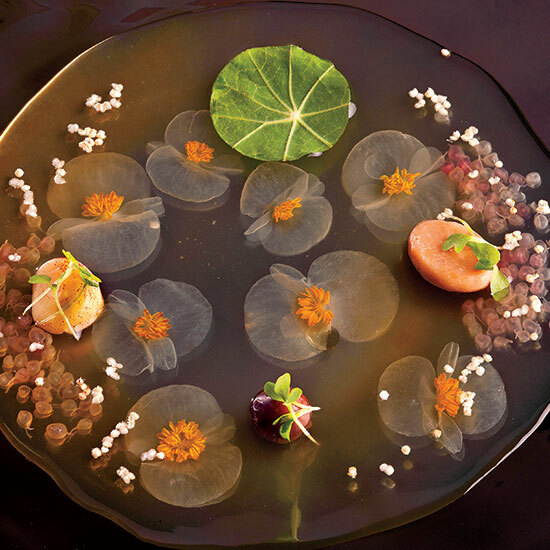 The year 2008 stands out: Not only did Adrià perfect his now legendary technique of spherifying (encapsulating flavors within bubbles), he also became fascinated with Japan and natural landscapes. Adrià calls that Japanese influence "one of the characteristic features" of El Bulli. No dish exemplifies that more than his Water Lilies soup. There are 16 components, from a xantham gum–thickened floral broth (made with jasmine tea and mandarin orange blossoms, among other things) to vacuum-packed white begonia flowers and multicolored cashew "rocks" (freeze-dried fresh nut pulp). "This dish is very complex," says Adrià. "But the balance of its beauty and its nuanced flavors makes it magical."